Bandai Namco has revealed the Soulcalibur 6 character created by its own community. 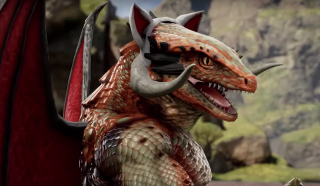 Across its various social media channels, Bandai invited the community to vote on several aspects of the character's features to show off Soulcalibur 6's character creation system. "The community has spoken!" Bandai says in the video description. "BEHOLD the #SOULCALIBUR fan made Wizard Lizard in action! Our epic community creation shows off his moves, weapons, and gear chosen with your votes around the world." Sadly, there are no plans to make Wizard Lizard a playable character in the final game. Sniff. The most recent roster announcement for Soulcalibur 6 is Raphael, who'll be joining a cast that—so far—includes Sophitia, Mitsurugi, Nightmare, Xianghua and Kilik, and Grøh.